a person familiar with the matter said. NEW DELHI: The telecom ministry is monitoring sales of the world's cheapest smartphone for Rs 251 each by a company called Ringing Bells, which claimed to have received 30,000 confirmed orders and over 6 lakh hits per second on its website on the first day. "The ministry is keeping a close watch due to the huge consumer interest at stake," a person familiar with the matter said. "An initial internal assessment of the ministry shows the price of the smartphone can't be less than Rs 2,300 but the government won't step in for now unless there's a proven case of wrongdoing." Noida-based Ringing Bells started pre-booking of the device at 6 am on Thursday and stopped by mid-day after its servers crashed due to what it said was an "overwhelming" response. Ringing Bells director Mohit Goel told ET that 30,000 orders were booked on the first day. That's a fraction of the 6 lakh hits per second on the website claimed by the company. Assuming an upfront payment of Rs 291for each phone, includingRs 40 for shipping, the company would have raked in over Rs 87 lakh with 30,000 orders. "We are not hiding anything," Goel said in response to questions about concerns raised over whether the phones would reach consumers. The money collected is being kept in an escrow account and the company won't get the funds till the deliveries are done. Orders will be taken for a maximum of 25 lakh phones online and another 25 lakh offline. "We are promising 100% deliveries to all 50 lakh bookings by June 30, starting from April," Goel said. After generating massive interest in India and globally, customers flocked to the website to place orders for the ultra-cheap phone. However, several of them took to Twitter to vent their anger and some even posted pictures of ordering half a phone at Rs 125 when bookings could not go through, sparking concerns about the company's promises. Asked about several dealer phone numbers, which were given on full-page newspaper advertisements and turned out to be mostly switched off or incorrect, Goel said most of the dealers had fielded thousands of queries since Wednesday and all numbers would be active from Friday. 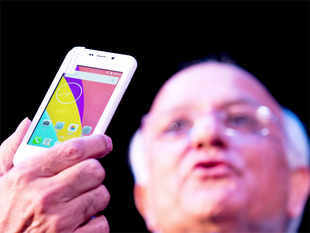 Ringing Bells had also offered the cheapest 4G smartphone last month, priced at Rs 2,999, deliveries of which will begin by February 25, Goel said, attempting to put to rest another controversy that had arisen earlier. The Indian Cellular Association , a grouping of local handset makers, has written to the telecom ministry, saying that even after extensive subsidising, a phone with specifications mentioned by the company would cost at least Rs 3,500 and the government should get to the bottom of the issue.